When you think of a smoothie, what do you think of? Probably fruit, some kind of milk and a protein powder or protein source. Am I right? Well the smoothies these days aren’t just compiled of fruits and milk. They have become a beautiful combination of fruits, vegetables, nut butter, vegan milk source and maybe a protein powder or green powder. Heck I’ve even seen cacao smoothies; chocolate shake for breakfast anyone? One such smoothie I keep seeing consists of beets. How the heck does that work? Do you cook the beet or leave it raw? Does it blend up enough? Won’t it taste overwhelmingly of beets? Well all these questions and concerns that I also once had, are now debunked. You can cook the beet, but I chose to leave it raw (more from laziness honestly, but I’m very glad I did). It does blend well, even if you don’t own a Vitamix. It is does not overwhelm you with beet flavor. 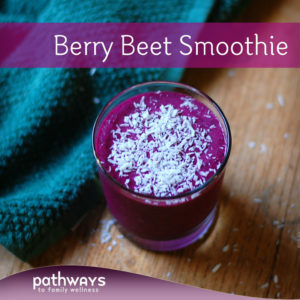 In fact, this smoothie combo made a very berryful smoothie with a hint of beet in the background; now that’s what I’m talking about! 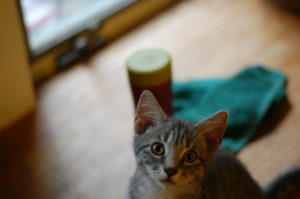 The hype of the green smoothie has passed. Alright it is still very much there, but there is a new veggie smoothie that has come into light and it is more satisfying than you would have ever imagined. Ready to try it? I assure you, you won’t be disappointed. Enjoy the process, and take it with you when your done for a nourishing and tasty breakfast smoothie. Combine all ingredients in a high-speed blender or food processor and blend until smooth (ish). 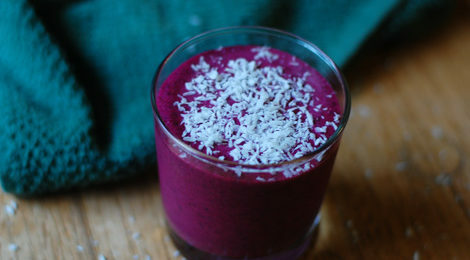 Top with coconut flakes or seeds if desired and enjoy! 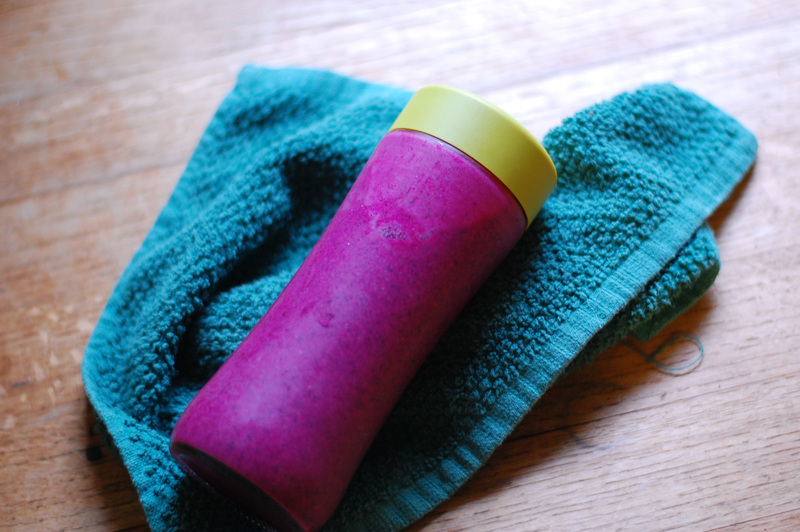 Note: If you have a Vitamix, you will be able to get this smoothie to be quite smooth and creamy. If not, it will be textured. We used a food processor and it blended it well; however, there were still some pulpy bits in there; we like it that way.